Orlando White is from Tlikan, Arizona. He is Din of the Naaneeshtzhi Tbaah and born for the Naakai Dine. He holds a BFA from the Institute of American Indian Arts and an MFA from Brown University. 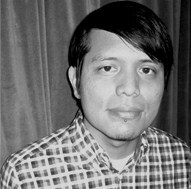 His poems have appeared in The Florida Review, The Kenyon Review, Ploughshares, Salt Hill Journal, Sentence: A Journal of Prose Poetics, Talking Stick Native Arts Quarterly and elsewhere. He teaches at Din College and lives in Tsaile, Arizona. Bone Light (Red Hen Press, 2009) is his first book. and stroke determine the ductus of a letter. of thought, an outline of the color white. the weight of ink, of languish. and from its ink skin pull out the skull of an e.
when it imprisons its self? nothing without the shapes of letters. surgical mask, grasps a dark minute scalpel. will augment to an outline of a dried skeleton. and witness its assemblage discourse.